It has been suggested that American IG be merged into this article. (Discuss) Proposed since September 2018. GAF is a manufacturing company based in Parsippany, New Jersey, that has roots dating back to the late 19th century. The GAF acronym stands for General Aniline & Film. The company has historically been primarily focused on manufacturing of roofing materials for residential and commercial applications. At one time GAF was also active in manufacturing photographic film as well as cameras and projectors (both still and motion picture), and was the manufacturer of the View-Master, the famous line of 3D transparencies, viewers and projectors. Briefly in the 1970s, it was the official film of Disneyland and Walt Disney World, and at this time, actor Henry Fonda served as the company's spokesman in several television commercials including one that featured Jodie Foster in her first acting role. A home in Avalon, NJ showing GAF Asphalt Roofing Shingles. 1892 – First ready-to-lay asphalt roofing is created, known as "Ruberoid"
1928 - The American holdings of the German company I.G.Farben were organized into American I.G. ; later renamed General Aniline & Film or GAF for short. 1941 - American assets seized as enemy property by the U.S. government. 1965 - The U.S. government sells shares of GAF. On Jan. 7, 2001, GAF's principal shareholder became the 27th company in the United States to file for protection under Chapter 11 of the U.S. Bankruptcy Code from liabilities relating to asbestos-related bodily injury claims. In what was an ill-fated acquisition, GAF's purchase of Ruberoid brought with it a product line that contained considerable quantities of asbestos. The asbestos-containing products ranged from roofing shingles and siding to insulation and numerous other construction-related products. Along with the purchase came ownership of an asbestos mine in Vermont. Once the sale was complete, GAF Corporation became the de facto leader in asbestos supplies in the state. The mine was shut down in 1975. GAF's roofing business (at the time, d/b/a GAF Materials Corporation) was not involved in the manufacture or sale of asbestos containing products and thus it did not have any liability related to these claims. GAF's shareholder emerged from bankruptcy in 2009 having discharged its asbestos-related bodily injury claims. All require a contractor to be fully licensed, insured, up to date on training requirements, and to be in good standing regarding customer satisfaction. ^ "General Aniline Buys Sawyer's; Management Stays in Portland". The Oregonian. Portland, Oregon. November 1, 1966. Section 3, p. 8. ^ "Two Chemical Company Boards Approve Merger". The Oregonian. Portland, Oregon. March 2, 1967. p. 31. ^ Barton, Frank (May 12, 1968). "New Name Merry-Go-Round". The Sunday Oregonian. Section 1, p. 33. 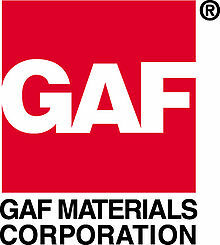 General Aniline & Film .... changed its name to GAF Corporation at the annual meeting in Portland on April 23 . ^ "GAF Roofing- Find Master Elite Roofing Contractors". GAF.